1. Illustrate an example of each of the three laws of motion. ​2. Use a large piece of paper - 3 illustrations on one sheet of paper or a Power Point. You may use video, GIF files, draw or use images from magazines or the Internet. 3. Define each of Newton's three laws. 4. Include an explanation of how the illustration demonstrates or describes the law of motion. 6. Write the explanation and definition next to the illustration. *Do not use a separate sheet of paper for the explanation. *Make sure your illustrations are colorful and neat. 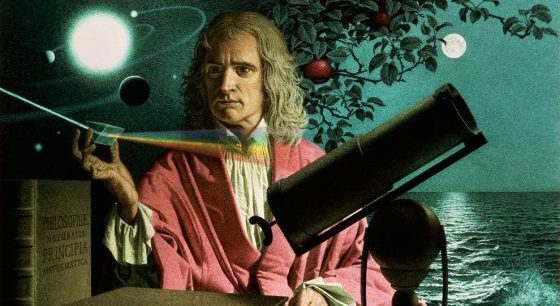 Sir Isaac Newton lived during the 1600s. Like all scientists, he made observations about the world around him. Some of his observations were about motion. His observations have been supported by more data over time; and we now call these Newton's Laws of Motion . His laws of motion explain rest, constant motion, accelerated motion, and describe how balanced and unbalanced forces act to cause these states of motion. ​Acceleration is a change in velocity. That means acceleration can mean a change in speed or direction. Acceleration can be thought of as an object’s change in velocity over time. Energy does not change, and that means it is constant. When one object applies force to another, the energy becomes an equal and opposite reaction. Newton 's first law of motion says that an object in motion will stay in motion and an object at rest will stay at rest unless acted on by an unbalanced force . • An object will not change its motion unless a force acts on it. • An object that is not moving remains at rest until something pushes or pulls it. • An object that is moving remains moving until something pushes or pulls it. • All objects resist having their motion changed. • This tendency to resist a change in motion is called inertia. • The more mass an object has, the greater its inertia . The second law of motion states that the force of an object is equal to its mass times its acceleration . • A change in motion occurs only if a net force is exerted on an object. • A net force changes the velocity of the object, and causes it to accelerate. • If an object is acted upon by a net force, the change in velocity will be in the direction of the net force. • The acceleration of an object depends on its mass. • The more mass an object has or the more inertia it has, the harder it is to accelerate. • More mass means less acceleration if the force acting on the objects is the same. Newton 's third law of motion states that for every action there is an equal and opposite reaction . • When one object exerts a force on a second object, the second object exerts an equal force in the opposite direction on the first object. • The force exerted by the first object is the action force . The force exerted by the second object is the reaction force .